JanBree’s 80 lbs Gone – I Promise It’s The Same Woman! Okay, I know. You don’t believe me. You think I’m trying to pull something over on you. There is no way these two women are the same. I promise. I give you my word. Hmmm, not enough, huh? I get it. I’m a diet coach, I must be telling a tall one. But, look. Look on the two front views. Look at her hands, they are held in the exact same manner. It’s her!! JanBree. Same woman, 80 lbs less. Amazing, isn’t it. The other day when Jan sent in her photos, she knew. She told the other divas that she was going to show everyone the pot of gold. So many obese women have no hope, no true belief that their lives can change. They think they are stuck. But, look. Look at JanBree. Stuck versus free! I am so touched by these photos. I know her transformation is going to inspire so many. She is going to be what obese women think of when they go home tonight, when they look in the mirror tomorrow. When they feel down and beaten by their weight, they are going to remember her smile, her glow, her style, her transformation. They are going to wonder, could that really happen for me. I’m telling you here and now, it can. It takes work, hard work. JanBree was not the fastest losing Diva. She had to watch Michelle fly past her in loses each week. She had to go days with no loss, but she never gave up, she never lost heart. She persevered, and here she is 9.5 months not just a few pounds from goal, which she is, but beautiful, and not just on the outside. Okay, I’ve been sappy long enough. Here are JanBree’s 80 lb gone before and afters! Be amazed. Jan, on behalf of the divas and all the other ladies at camp, thank you. Thank you for showing everyone this is a journey that does lead to that pot of gold and that each of us deserves the opportunity to get there. I am so proud of you. You’re beautiful and a real joy to have at camp. JanBree is a Rawk Starz Diva doing 2 hours of walking a day. I know you will be blown away by these before and afters as much as I was. Jan had two things that slowed down her loss this past month and a half. High stress and an injury. September’s weight loss was agonizingly slow, but being the diva she is, she kept to her program and even found ways to get in her exercise without causing any more injuries. Everyone at camp was inspired by her patience and perseverance, and as you can see by her photos. It paid off. She now seems back on track to hit goal in the next month and a half and join our Maintainer’s group well before the end of the year. How cool is that? 70 lbs in 7.5 months. She started with us in February. 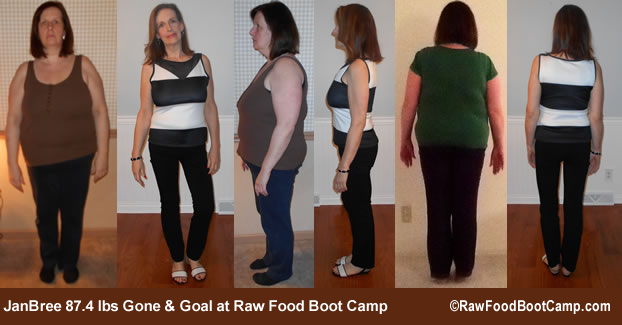 Joined the Divas in May, I believe, and soon, in well less than a year, she will not have only reached her goal weight, but through her journey with RFBC have changes so much of her thinking about food and the role it plays in her life. She is also the hero in the Rawk Starz Diva challenge for her commitment for early morning exercise before she starts another hectic day. Wow that’s so amazing! I tell her all the time how proud I am of her! Now she looks like I have always seen her, and I hope she sees it too. Thanks so much for helping my mom get so healthy and provide such a wonderful support group! That made my day! Congrats to JanBree for giving us all hope that if we want something, if we don’t give in when it feels so tough, that it can be ours. She is a true hero at RFBC! JanBree does our Rawk Starz Diva program with 2 hours of walking a day. The other day, Jan talked to me about how she was a slower loser. She worried she hadn’t kept pace with Michelle or the Michelle-O-Meter, as she called her! I had to shake my head. Jan didn’t come to camp for the 100 lb challenge, she came to camp to become a thin healthy woman with a new attitude toward food and her body. Which is easily happening for her. 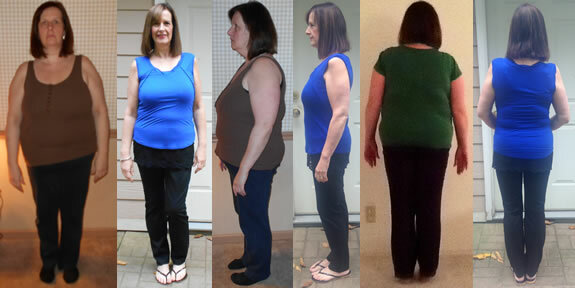 So, I asked her: “When was the last time you lost 60 lbs in 6 months?” “Never,”she replied! So what do you think? Was six months worth her time for this kind of change? I know what you’re thinking. That can’t possibly be the same woman. I even thought that. When I sent the photos to Jan, she wrote back and agreed, no one was going to believe it was the same woman especially with her head cut off, so she offered to let you see her face. How cool is that? All I had to say was wow, wow, wowzer! OMG!!!!! I can’t believe that was me then–and omg look at me now. Wow. That person in the before picture–I don’t even know how I functioned. I remember feeling sad and hopeful at the same time in that before picture. How cool is it that her B&As even surprised her! Congratulations JanBree! We are all so proud of you. JanBree was losing weight at a moderate pace, then she joined our Rawk Starz Divas upping her walking to the 2 hours a day, and wow, she has been dropping weight so fast that her next photos at 60 lbs gone will happen before you know it. She’s on vacation this week, but keeping tabs with me and doing great! We are all so proud of her. Woo Hoo, JanBree, awesome job so far at camp. Can you see the difference? I can. Check out that side photo. Way to go! There is a big difference in her face, especially her smile! But you don’t get to see that, sorry!